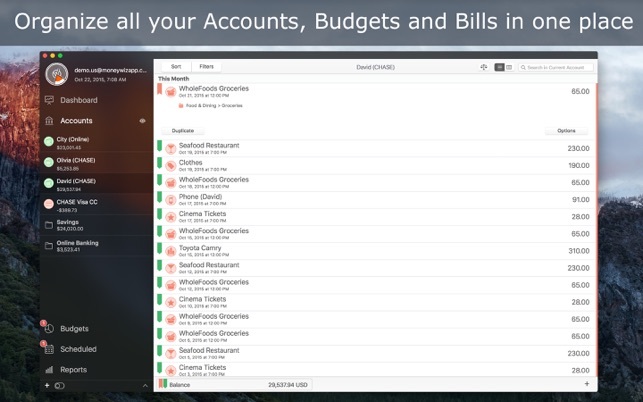 Have all your accounts, budgets and bills in one place! 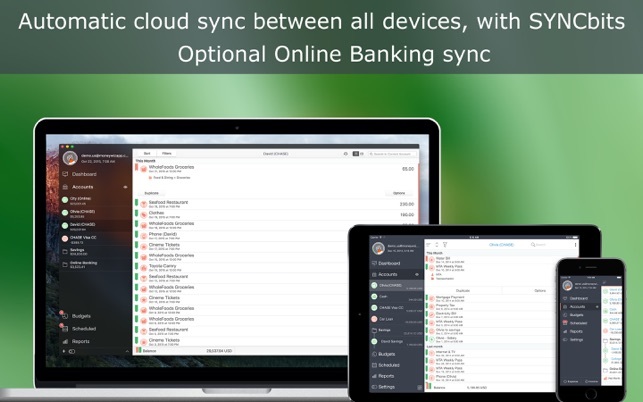 With powerful reports, worldwide online banking and instant sync between all your devices! 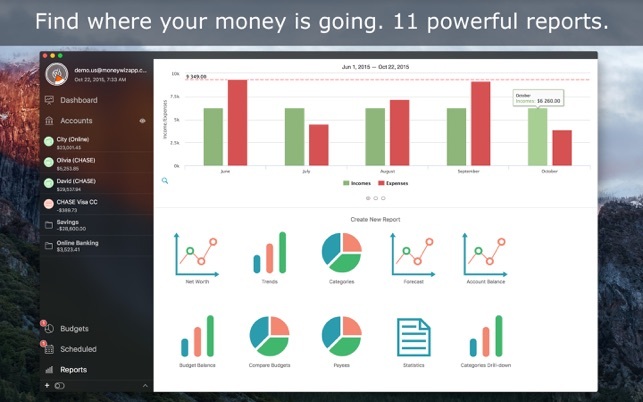 That’s MoneyWiz - the world’s most powerful and beautiful finance software. ● ACCOUNTS: Have all your accounts in one place. Arrange them in groups, give them icons and decide which accounts count towards your Net Worth. Choose from variety of accounts: Credit Card, Checking, Savings, Loan, Investment/Brokerage, Cash or Online Banking. 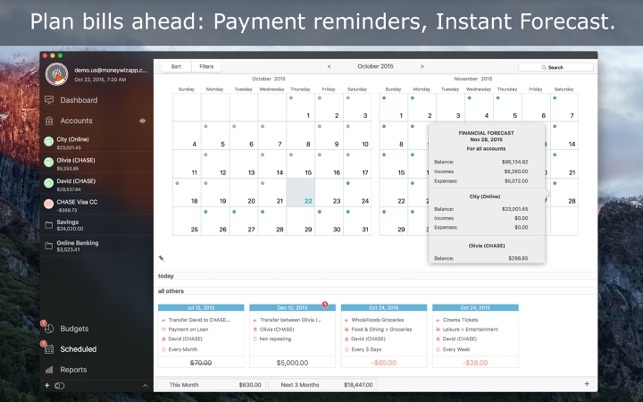 Your MoneyWiz Online Banking subscription will automatically renew each month (or year, depending on plan) and your credit card will be charged through your iTunes account. You can turn off auto-renew at any time from your iTunes account settings. 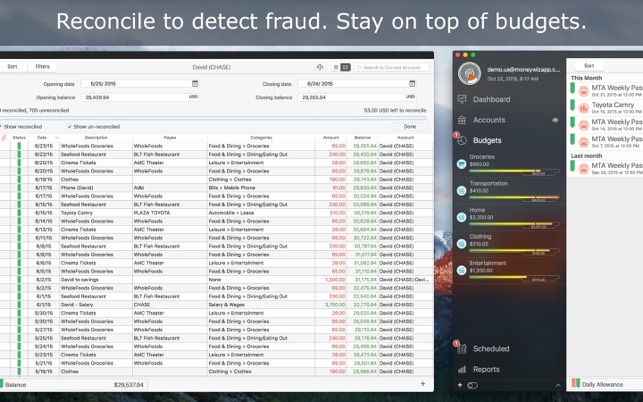 MoneyWiz has become my preferred and only money management system. Very good functionality both on iMac and iPhone. Perfect cloud system that syncs all devices instantly. Very good helpline, if (rarely) needed. I admire the software developpers for their skills. Well done, to say the least. Ich habe nach einem Programm gesucht, dass eigenständig lüft und alle meine Konten, auch Online-Konten verwalten kann und in der Übersicht behält. Insbesondere nach dem letzten Update hervorragend! Hier werde ich pünktlich anZahlungen erinnert und behalte auf einfache Weise den Überblick. Ich habe noch nie auf ein programm vertraut, dass sowohl die Daten abruft als auch in dieser Form verwaltet, darum ist dies hier für mich ideal. Das Zusammenspiel iPhone, iPad und Mac klappt ohne Probleme. MoneyWiz ermöglicht mir eine präzise Überwachung meiner Einnahmen und Ausgaben sowie eine Planung meiner Finanzen dank der Hochrechnung-Funktion, die ich so bei keinem anderen Programm kenne. Dazu funktioniert auch die Synchronisation mit den Apps für iPhone und iPad perfekt. Ich bin restlos zufrieden!